As a quaint addition to your storage collection, our Amish Made Siesta Mission Chest of Drawers offers more space for your clothes, linens, and everyday necessities, while occupying less floor space. The classic Mission style offers a clean look, with flat sides that lead to the flush mounted drawers, square feet, and arched base, giving you a piece that can be incorporated into a wide range of different decor. The five drawers are each dovetailed and mounted on full-extension slides, offering you complete access to all of the contents inside. Add the optional under-mounted slides to relocate them out of sight, while incorporating a convenient soft close mechanism that ensures you never slam a drawer again. Shown here in a beautiful Quarter Sawn White Oak, with Michael's Cherry Stain, choose this combination or choose from ten different hardwoods and an array of different stains to incorporate this chest into any bedroom suite. You can also choose this classic Mission hardware, or another style to completely customize this piece. If this piece is "the one" - but the size isn't perfect for your available space, that's not a problem. 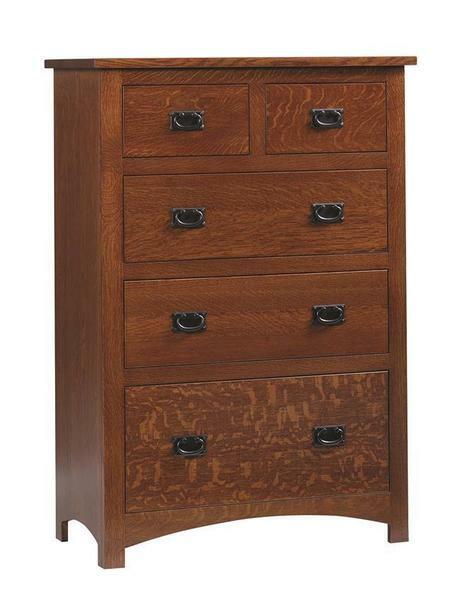 Call one of our furniture specialists today to request a custom quote on your new Siesta Chest of Drawers at 866-272-6773. We are also easy to reach at our email address - Questions@DutchCrafters.com.